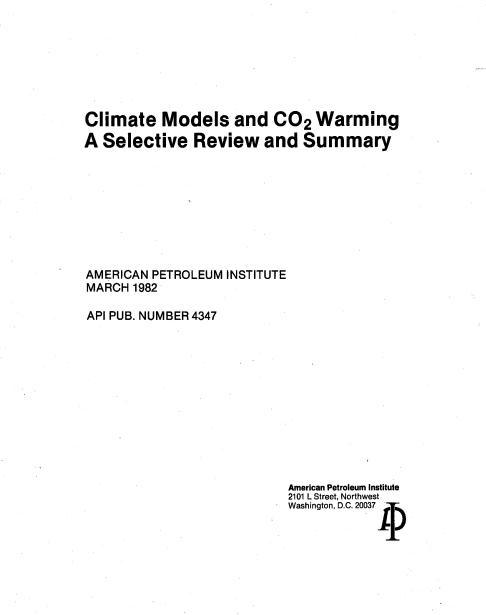 “Climate Models and CO2 Warming: A Selective Review and Summary” prepared for the American Petroleum Institute by the Lamont-Doherty Geological Observatory March 16, 1982. The report includes a discussion on the types of models used to predict anthropocentric climate change. The report also highlights the fact that carbon dioxide concentration has increased since the beginning of the industrial revolution from about 290 parts per million to about 340 today (1981) and that it is expected to double over the next century.